No one enjoys an unnecessarily loud automobile. Noisy exhausts, squeaky doors, and loud engines keep you from enjoying your time on the road. They may even become distractions or overpower the car speakers. While these noises are annoying, loud wipers can be just as troublesome. What is the advantage of having silent wipers? Late at night or early in the morning, squeaky wipers can echo through a quiet neighborhood. When driving, loud wipers may cause a continuous disturbance that keeps you from giving the road your full attention. Besides these issues, you may simply want to create the quietest ride possible. Luckily, there are many whisper-quiet wipers to choose from along with DIY tips for keeping wipers from grinding across the windshield. You first need to ensure that you find blades that are compatible with your vehicle. The two details to consider are the blade length and latching mechanism. To find these details, check the owner’s manual in your glove compartment. Most vehicles use 22-inch to 26-inch blades but the sizes can vary. The latching mechanism comes in three standard styles: J-hook, bayonet, and side post. The installation depends on the mechanism. The next consideration is the blade style. The main three options include frame-style, winter blade, and beam-style wipers. The frame style is the most common type of blade. It features a metal frame that holds the actual wiper, which is a strip of rubber with metal backing. These are the most affordable option. Frame-style blades typically feature rubber squeegees that can be replaced without replacing the blade. However, this has become less common in recent years. Replacing the rubber insert is a frustrating task as it can bunch up while you feed it into the blade. Most people simply replace the entire blade, which has led to a decrease in options for replacing the insert. The winter blades are designed for use in areas that receive snow and ice during the winter months. They are similar to the frame-style blades but with a rubber shell over the entire blade. The blade is protected against the weather, helping to prevent wear and tear. The premium beam-style windshield wipers are the most expensive option. Instead of a separate frame and rubber blade, the beam-style wipers are made with one-piece construction. They also feature a spring-steel band that allows the blade to conform to the curve of the windshield. As you’ll likely need to replace the entire blade, the type of material used for the squeegee becomes one of the most important factors. 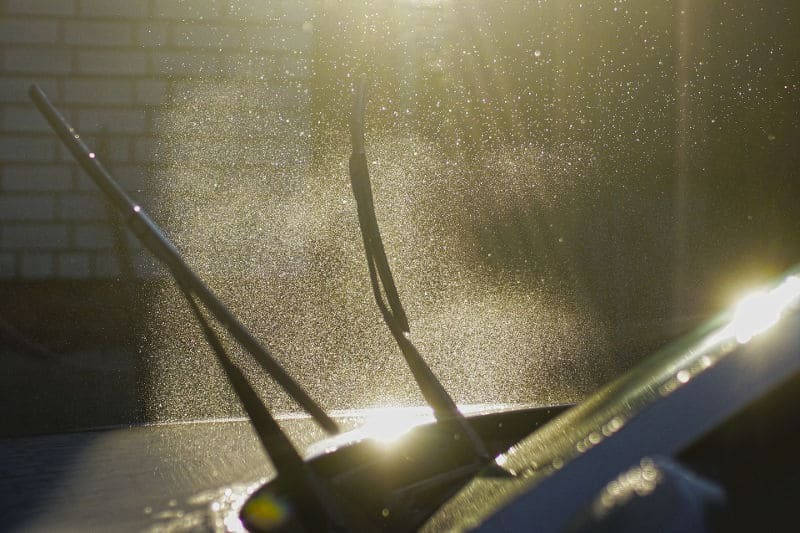 Unwanted noise from your wipers is often the result of worn squeegees or damaged wiper arms. The arms may become bent from sitting in the same position all the time. The rubber squeegee that wipes your windshield clean may slowly deteriorate and become less effective. If you want a quiet wiper, search for wipers with durable materials, especially the material used for the squeegee component. The most durable options include hardened rubber and silicone. The drawback to hardened rubber is that it can remain stiff, which can cause the wipers to squeak as they move across the windshield. Standard rubber blades do not have the same problem but they also deteriorate more quickly. Silicone is built to last. It is also heat-resistant so it doesn’t warp or wear due to sun exposure. For the quietest operation at an affordable price, the best options tend to be winter blades, which are also sometimes called all-season blades. They are often made with durable materials for the squeegee part, reducing the risk of issues that commonly cause unwanted wiper noise. The premium beam-style wipers made with silicone are also great choices but they tend to cost a little more. Remember these details as you compare the top windshield wipers for whisper-quiet operation. Consider the length of the blade, blade style, and squeegee material. These all-season blades are designed to last longer even in extreme conditions. They are made with a durable polymer material that keeps the frame from warping or bending over time. The exterior of the blade features a silicone rubber strip, which helps create silent wiping action. This silicone material is naturally resistant to wear and corrosion while the exterior material protects the blade from exposure to the elements. One of the best features of this quiet set of wipers is the latching mechanism. It includes a universal mechanism that works with over 99% of vehicles. The ANCO blades are another set of winter blades. Instead of silicone, they feature a rubber compound that wraps around the blade frame and provides a streak-free wipe. The thick rubber material should offer a longer service life compared to some of the cheaper blades. The 22-inch set is not the only size. The options range from 11 inches to 24 inches. You can also choose between individual packs or five-packs of wipers. A five-pack set is an interesting number of blades but at least you’ll have a few spares. The latching component works with pin-style or J-hook mechanisms. This should suit a wide variety of makes and models. With the Bosch Aerotwin Wiper Blades, you get beam-style wipers made with aerodynamic all-steel frames. These durable frames also include a fully enclosed metal tension spring to ensure that the wiping edge has a snug fit against the windshield. The squeegee is made from precision-cut natural rubber. It is not the most durable material but it is flexible, which helps cut down on the screeching sound of stiff blades grinding on the windshield. The blades are available in a variety of sizes to suit most vehicles. The locking mechanism options include top lock, side lock, and pinch tab. Most people recognize Safelite as the windshield replacement company. They also produce quality beam-style blades. These wipers are made with steel blades for added durability. They also have side mount couplers that are designed to reduce wind lift, keeping the wipers firmly on the windshield and reducing chattering. The blades are available in sizes ranging between 13 inches and 28 inches. With the Easy Connection Technology used on the locking mechanism, they should fit most cars, trucks, and SUVs. Rain-X is a trusted brand that produces some of the best windshield wipers. In fact, this wiper blade won the 2017 Product of the Year award in the Car Care Category. These are beam-style blades. The blade contours to the windshield and includes a high-quality tension spring for the perfect fit. It also features a universal adapter for simple installation on almost any make and model of vehicle. The wiping edge is made from synthetic rubber that is designed to last through multiple winter seasons. While these are among the top-rated blades, they are still reasonably priced. For less than $20, you get a single blade that should offer whisper-quiet operation. Overall, the Rain-X is the top choice, thanks to the advanced features. The synthetic rubber is highly durable while the aerodynamic spoiler reduces wind lift, which are both features that help reduce noise levels. If you are a first-time car owner, there are certain maintenance tasks that you may have never dealt with. This includes learning how to replace windshield wiper blades. Luckily, replacing the wipers is a simple task. You don’t need a mechanic to help with this. In fact, you don’t even need any tools. After obtaining your new wipers, double-check to ensure that you got the right size. The wipers should have the length listed on the packaging or imprinted on the wipers themselves. Turn off your vehicle and keep it in park. Find the unlatching mechanism for the wipers (some have a button or a latch). Unlatch the wiper blades (you may need to jiggle the blades a little). Remove any protective plastic from the new wipers. Latch the new wipers into place. Turn on your vehicle and test the wipers. Replacing the wipers is easy but if you run into any problems, there is a chance that the wiper blades are not compatible with the latching mechanism on the wiper assemblies. Besides replacing your wipers, there are a few ways to make your existing wipers operate a little more quietly. These tips are often effective when something is keeping your wipers from running smoothly. First, you should understand that wipers are not made to last forever. The rubber blade that wipes your windshield clean slowly deteriorates. It may even start to rub against the windshield, creating an unpleasant noise. You may also notice that the blades skip over parts of the windshield. This is often caused by the blades slowly curving due to a lack of use. If you detect these signs, replace your blades. If the wipers are not worn and continue to squeak, there are several steps that you can take to maintain your windshield wipers and prevent unwanted noise. The squeaking may be caused by debris stuck to the wipers. Use a wet towel or rag with rubbing alcohol or soapy water to wipe the blades clean. If the wipers continue to squeak, clean the windshield. Use glass cleaner to wipe the windshield clean and remove any obstacles that are keeping the wipers from working properly. For incredibly dirty windshields, use baking soda to help loosen debris. In some cases, the wipers may start to squeak because the windshield is too dry. Never run the wipers on a dry windshield as this wears the rubber squeegee and causes streaking and squeaking. Check the windshield wiper fluid. Top it off if it’s low and always use fluid when using the wipers to clean the windshield. Another option for dealing with squeaky wipers is to wipe them down with oil. Use WD-40 and an old rag to wipe the blades, including the rubber or silicone strip and the arm. If the blades are squeaking near the wiper assemblies instead of against the windshield, you may need to loosen the fasteners. Most wiper assemblies feature a small plastic cover that can be popped open with a flathead screwdriver. Use a wrench to slightly loosen the fasteners. Close the cap and test the wipers to see if the sound went away. These steps should help keep your windshield squeaky clean without needing to listen to squeaky wipers. Windshield wipers are designed to keep the windshield clear so that you can keep your eyes on the road. When the wipers start to grind or squeak as they wipe across the surface of the windshield, you may get distracted or struggle to see through a dirty windshield. The best way to avoid this problem is to maintain your wipers. Check them regularly for signs of deterioration as this is often the cause of the squeaking. If the wipers are worn, replace them. The best options include winter blades made with toughened rubber or the premium beam-style wipers made with silicone. These blades last longer, helping to delay the inevitable noises as the worn wiper streaks across the windshield.